FUE hair transplant is a minimally invasive and non-stitch hair transplantation surgery in which grafted follicular units is injected in the balding areas. Under local anaesthetic, the treatment involves minimal risk and downtime compared to other hair transplant procedure. In Manchester FUE hair transplant has become one of the major services offered by many reputed clinics. If you have tried everything but have already lost a lot of hair do not disappoint because you have still many options that are safe, effective and reliable. One of them is FUE hair transplant that does not trigger hair re-growth but redistributes existing hair follicles on your head to add a thicker and fuller look to your scalp. It does not even require adequate donor hair as it can harvest donor hair from any part of the body that is suitable to be planted on your head. Who is eligible for FUE hair transplant? Not everyone is a good candidate for FUE hair transplant and before undergoing the procedure you should have realistic expectations. The eligible candidates for FUE hair transplant are men and women who have lost their hair due to some cosmetic procedure like face-lifts or due to burns or trauma. Those who are suffering from pattern baldness or have been balding for many years are some of the suitable candidates for this treatment. What is the procedure of FUE hair transplant? The area of the head is cleaned where follicles are going to be harvested. The area on the head will be then numbed with a local anaesthesia. The follicular units (groups up to 4 hairs along with surrounding skin) will be removed from the donor site. The targeted areas are then marked by incisions and the follicular units are then inserted into incisions. What could be the risk factors? Who should not opt for FUE hair transplant? People who are completely bald should not opt for FUE as it is a treatment suitable for smaller areas of baldness. People below 25 years of age, low density on the back of the head or suffering from a medical condition such as diabetes, heart problems, etc should not opt for this procedure. Can someone do other treatment simultaneously? It is true that FUE hair transplant is safe and effective but it is a surgical procedure. If you want to do other treatment simultaneously with this one then you have to ask your physician. Men with realistic expectation or who are suffering from male pattern baldness, etc should opt for FUE hair transplant. Similar to men, women who have lost their hair due to female pattern baldness, burns or trauma or due to some other reasons can go for FUE hair transplant. With the advancement of technology many surgical hair loss treatments have emerged to provide less invasive technique. 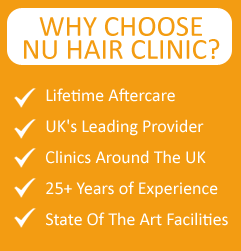 Nu Hair Clinic at Manchester provides superior options for treating hair loss. You can change your life forever with FUE hair transplant done by the professionals in our clinic. 120 Princess Road, Manchester, M15 5AT.